The Things I Said I'd Never Do: Friday Foodstuffs and PIF Friday!! Friday Foodstuffs and PIF Friday!! Holy Crap did we eat well over the week. Pretty much everything but the Spaghetti and Meatballs was a success. The two dished I would most recommend are the Butter Chicken and the Basil Lime Fruit Salad. The Butter Chicken was un-frickin-believable. Seriously delish and super easy. However, I only used about half of the cream the requested. Next time I make it I am going try adding some veggies to the dish. I also might branch out and instead of cream, use coconut milk. If you can get it, I suggest serving a side of naan to sop up all the delicious and fattening sauce! The Basil Lime Fruit Salad was an awesome complement to our "breakfast for dinner" night. I've made it before and it's a nice twist from a regular fruit salad. It's perfect for a summer picnic or perhaps a baby/bridal shower. Again, I'd half the amount of the simple syrup poured over the fruit, otherwise it buries the natural sweetness. Our grocery bill has gotten a bit out of hand over the past few weeks so with this weeks menu I tried to focus on recipes made from stuff we already had on hand. I did a sweep of the freezer and cupboards before deciding on a menu. *Do you have a Pampered Chef Deep Covered Baker? No? Well you should. It's a lifesaver. What you are eating this week? The kindest thing someone did for me this week comes from my boss. We have a crazy week coming up and have been preparing for it over the last 6 month. Since "The Event" is about to reach it's climax, there is much to be done. More than I can accomplish in my measly 24 hour work week. Yesterday, when I realized there was no way I could leave at my regular time, she cleared me for some overtime. Then, she said "Why don't you go get Max and bring him here". So instead of letting the poor kid sit in day care for an extra 90 minutes, I ran across the street, picked him up and brought him back. I always keep a blanket in my office and toys in my diaper bag so I plopped him on the floor and let him play at my feet while I finished up a few things. I loved having him there. It made working on such an arduous task a little easier when I could turn around to see my cute little dude smiling up at me. My boss didn't have to allow such a non traditional work arrangement and I am grateful for her kindness in suggesting Max come hang with us. I do think she loved some baby time too! 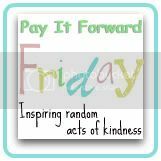 Spread some warm fuzzies by sharing the kindness bestowed on you! Link up with Mama Nash.